Mushroom is used as vegetarian in normal cooking, We all know mushroom has lot of medicinal value it can be eaten as raw and cooked.Interestingly cooking increases the amount of antioxidant vitamin C in mushrooms.Cooked mushrooms are an excellent source of the mineral selenium. The Office of Dietary Supplements reports that selenium protects the body against tissue-damaging free radicals.We have lot of fascinating recipes to prepare mushroom in this case today we will look after Mutton gravy form by using Mushroom. Heat pan with 2 tbsp of oil and splutter the above” For seasoning” ingredients. Add curry leaves chopped Onion and Garlic saute until onion garlic turns light brown. Add Tomato and salt saute till Tomato looses its skin. Now add Cut Mushroom and saute well in medium flame gradually it will shrink and colour changes to gives nice aroma. Add ground masala paste allow it to cook for 3 more minutes. 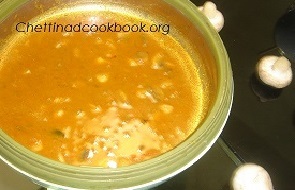 Transfer to a serving bowl and serve with Steam cooked rice or Ghee fried rice.